(Defiance, Ohio)- The Yellow Jackets women’s basketball team came up short on Senior Day as they were defeated by Transylvania, 95-58, in the Weaner Center. Opening the game was Stamm with the first of the seven threes she had on the day. The score was tied at 6 with 6:42 remaining. The Pioneers went on to score five straight points to end the quarter up, 25-19. DC had a hard time converting in the second quarter, only getting 12 points compared to Transy’s 24. After a 12-2 run for the Pioneer’s, Transy extended their lead to 49-31 going into halftime. A few threes from the Yellow Jackets cut the deficit to 13 with 6:17 left in the third. Transy’s defense came alive and looked to be too much for DC. After going scoreless for almost 4 minutes, DC’s Lauren Rogers ended the drought with a jumper. The third quarter ended with the Pioneer’s up, 68-44. Shelby Stamm led scoring with a team best of 22 points while Sam Ervin added 14 points and 4 rebounds. Whitney Schalk added in 10 assists in the loss. 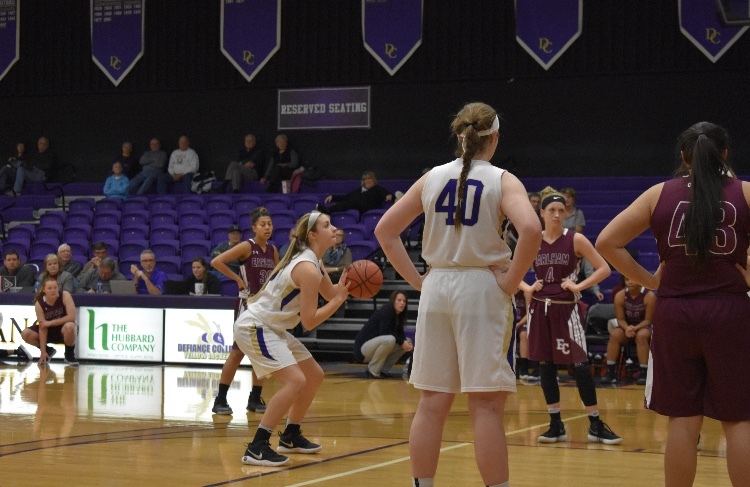 (Richmond, Indiana)- The Defiance College Women’s basketball team dropped a match,74-49, in HCAC play at Earlham on Wednesday evening. DC started the game out strong with a triple from Ashley Lee. Earlham hit a three to tie it before Stamm hit a jumper. Schalk and Stamm aided in bringing the score to 11-7 with DC leading. The Yellow Jacket lead grew to 7 points before the Quakers ended the first quarter on an 8-1 lead to tie it up 16-16. To begin the second quarter, Stamm and Lee went 3 for 4 from the free throw line getting a 3 point lead. The Quakers started on a 6 point spurt before Ervin ended it with a layup. Earlham then went on a 17-6 run to take the 39-27 lead heading into halftime. Earlham came out of the locker room and scored the first 5 points of the second half to up the DC deficit to 18 points. A pair of free throws by Stamm ended the 5 point spurt before the Quakers hit a jumper to bring their lead back to 18. Earlham scored four points to get their biggest lead of the game, 51-31 with 4:21 left. Rogers hit a triple before Earlham hit 11 straight points to keep a hefty lead, 62-34, heading into the final quarter. The Yellow Jackets wrap up their season with a game at Hanover on Saturday February 17th at 1:00 pm.